I like the saying on this card! But I have to be honest and say, I don't really think I'd send you a blizzard!! I don't wish a blizzard on ANYONE!!! And then thinking of them in terms of hugs made me think of my nephew Emilio. My sister Teresa and her family sent me a package for my birthday that included 50 kisses & hugs (Hershey.) They live in Arizona, and the thought was perfect! But what I loved even more was the story that went with it. If you don't know this about me already, I LOVE KID STORIES!!!! LOVE, LOVE, LOVE!!! I don't always have the greatest memory, but when it comes to kids, my memory is amazing! They just stick in my head!! So the package included love notes from the kids and a note from Teresa that said Emilio (5) seemed thankful he didn't have to personally deliver them. Haha! I wish I could have recorded Emilio when we were discussing your gift and that I wanted to give you 50 kisses. His eyes got big and his hand slowly covered his mouth. It STILL makes me laugh!!! Ok, and here I thought this was gonna be a quick post! So my plan is to show this bundle on my Facebook Live! tomorrow. I saw some cool ways to use it while I was on the cruise and just never squeezed it into a class! Of course, you know I love the color! And I love the glitter and just wanted to make sure you can see it! Hope you can join me tomorrow for my Facebook Live! 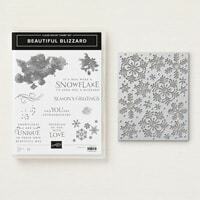 Tags: beautiful blizzard, bundle, hugs, kisses, stampin up, SU!